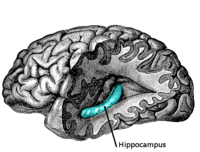 “You never heard of the hippocampus? It is the part of your brain that remembers things, especially new stuff. You know, if you move to a new neighborhood and go out for a walk, how to get back home. Where you parked at the mall or the date of a doctor’s appointment.